Club Hill is recently opened night club in Belgrade and represents the winter version of river club Jimmy`s, the most popular summer river club during last season. If you had a good time on Jimmy`s, then you will definitely enjoy club Hill. 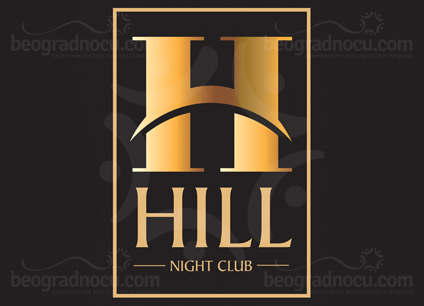 Club Hill is located in one of most prestigious part of Belgrade, in Senjak, in No 56 Vase Pelagića Street, at the place of former club Koletiv. This season, club Hill will have a leading position as this type of club. Besides of the change of location, this club will keep the most important references of river club Jimmy`s, precisely, this club will be known for high level service, guests performances of music stars and best party in town. Last season at river club Jimmy`s you could enjoy, at the performance of Nataša Bekvalac, Dado Polumenta, Aca Lukas, Adil, Džj, Miligram, Saša Kovačević, Ana Bekuta and many others. With guest performances of many stars, you could have so much fun in pleasant and sophisticated interior of club Hill. Besides, beautiful and elegant place, this club allows you relaxed and entertaining atmosphere. Architecturally speaking, club Hill is designed so you are always in the spotlight, wherever you are located. If you want to hear a great live gig, either you are with your friend, or your significant other, club Hill is ideal place for it. The certain thing is, if you decide to go out in club Hill, you will not make mistake. The management of river club Jimmy`s, and recently opened club Hill, is enthusiastic group of people, providing best entertainment in town. Club Hill, provides high class entertainment, with quality music and company of many celebrities and athletes. Club Hill has its own parking, which gests can use.